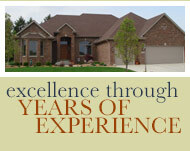 In addition to our Standard Features, we also do whatever we can to assure excellence. 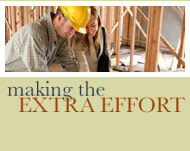 We pride ourselves on building homes that meet and exceed our clients expectations. Below is a list of unique actions we take to achieve our goal. We use top of the line Advantech subflooring on all of our homes that assures you the best subfloor available. All of our subfloors are Glued, Nailed, and Screwed. Thats right, before any finish flooring is installed, we make sure all of the subflooring is additionally fastened with screws, NO SQUEEKS. As you can see, we make every effort to build you the best home possible by using the best materials and methods available.